Vintage Purse a Day: SPECIAL POST! We just launched our Kickstarter! Because this old bag loves old bags. SPECIAL POST! We just launched our Kickstarter! This is the blog of The Vintage Purse Gallery, a FREE online purse museum. For more about the collection, visit VintagePurseGallery.com. Special thanks to Collectors Weekly for adding this site to its pages! Seriously. 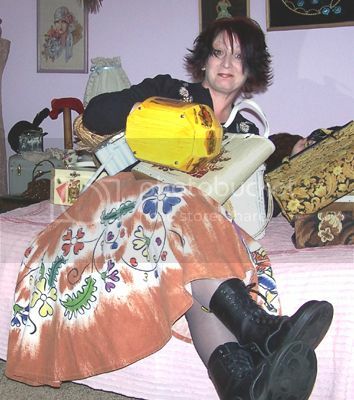 Click my face to get to our main website, The Vintage Purse Gallery. 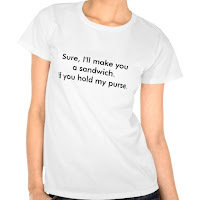 Click the shirt to see more purse-themed tees! Welcome! I'm Wendy Dager. Collecting vintage clothing, jewelry and accessories has been a hobby of mine for over twenty-five years. I eventually became obsessed with whimsical vintage purses, at first accumulating my collection gradually. However, when online shopping began, I went a little nuts. A lot nuts, actually. My husband had to build an entire wing on our house just for my vintage purses! Being fairly thrifty, I've spent as little as 99 cents but never more than $85 on a single vintage purse. 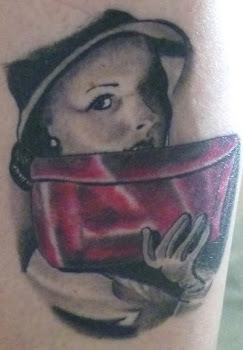 The collection continues to grow and our site, The Vintage Purse Gallery, has many visitors from all over the world. February 1, 2015: BIG NEWS! I have completed the Art Museum and Gallery Studies online program at CSU East Bay and received my certificate. If you have questions or comments about vintage purses, please e-mail info(at)vintagepursegallery(dot)com. All photos, commentary, punctuation, grammatical errors and general silliness on this blog copyright 2007-2015 by Wendy Dager and The Vintage Purse Gallery. If you want to use something found here, please request permission by emailing info(at)vintagepursegallery(dot)com.